You've made it! Your clients love you, and you're at the decision stage with another potential customer. Ultimately, that's the goal, right? To have clients and partners who love you so much that they become brand ambassadors, and share how much they love you, then their friends become customers, and the web of brand ambassadors and loyal followers continues to grow. Well, it's time to capitalize on that love, and have your customers provide video testimonials for your business. Customer testimonials are great videos to have in your content arsenal - your potential customers trust the honest opinions of other people. People prefer to see this type of review from your customers, as opposed to solely believing how great you are from your marketing content. Potential customers appreciate the honesty, and it truly increases your brand's trustworthiness. 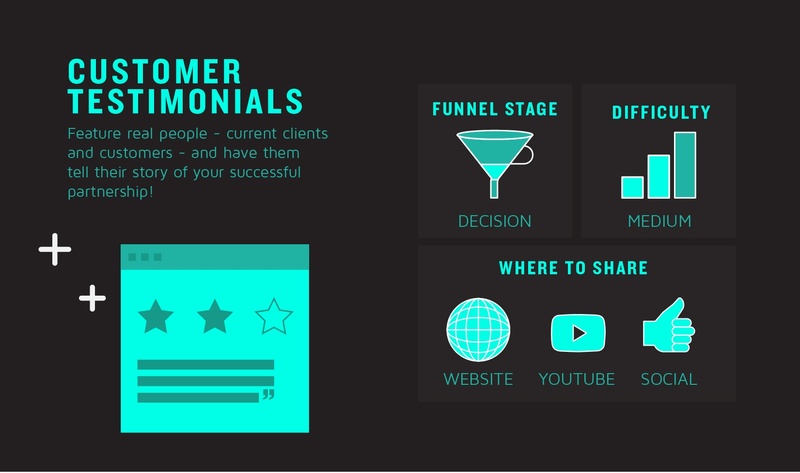 That's why testimonials are key - hearing from someone outside of your business is more persuasive. Being in front of a camera can be nerve-wracking for some, if not all people. So, it is best to set realistic expectations for the whole day's schedule, which can help them prepare mentally, and take a bit of the unknown stress away. Outline the schedule for the shoot, who will be in attendance, and any other details you feel are pertinent for them to know, and help put their minds at ease. Provide some pre-production documents to the team detailing tips for the shoot - what to wear, how to do their makeup or hair, what your vision is for the shoot, etc. We know - this is a surprise given our advocacy for scripting. But, given the more natural nature of this video type, scripting the conversation will lead to a video that feels a bit forced. Memorized lines may give off the vibe that the message was actually crafted by you - the marketer - not the person on-screen - the client. Alternatively, you can provide a guideline on points that should be covered, so they know what will be asked, but it should serve more as a guide, as opposed to a scripted convo. Providing them with a document beforehand helps them pre-identify the benefits of your products or service that they love, or the results that ensued. Don't waste your intro screen with brand information - you have less than 3 seconds to capture your audience's attention. Jump into the goods early on. This isn't something to be concerned with while interviewing your subject, but during the editing phase of the video, it is crucial to arrange your interview questions in a particular way to showcase the attention-grabbing quotes first. There is a major difference between features and benefits. While customers care about the features, hence the product demo, the benefits are ultimately what sell your product or service. Have your interviewee focus on the problems that your product solves during the customer testimonial, which will naturally progress into a conversation about your company's benefits. Check out our infographic displaying OUR benefits as a video content partner for some inspo. Just like other videos for your B2B video content, customer testimonials should be kept short - the sweet spot is around 45 to 60 seconds. But, take your time during the actual interview to gather your customer testimonial footage to fuel this 45-second video. Encourage conversation, keep it casual, and hopefully, you receive a genuine response - make the interviewee forget that the cameras are there. The more casual and genuine conversation that you're able to achieve, the more believable your testimonial becomes. We understand the love you possess for your product. We get it! But, don't try to cram it all into a customer testimonial. It will not be beneficial for your customer testimonial video to seem like the interviewee is reading off a list of benefits - that's not natural. Also, potential customers can only take in so much content in one short video. So, if you try to jam it all into one video, your lead could walk away without retaining anything. Your conversation with the interviewee can be the most captivating conversation ever - but as a viewer, if you're stuck watching a singular talking head for 3 minutes, you're bound to get bored. So this is where the creativity in post-production truly shines. Share the screen with a variety of footage, not just the interview's head, to provide some visual interest. Consider setting up and shooting your subject from multiple angels, adding in some product shots, lower third graphics, and b-roll to spice it up. Whether you're very well-loved, and you have created many customer testimonial videos, or this is your first one, keep these tips in mind to create stronger, more believable videos in the future. Utilizing our knowledge will lead to better conversations with your customers, and will ultimately produce more compelling customer testimonial videos. Shoutout to Vidyard for the inspiration behind this whole infographic series. To see the full infographic, click here!